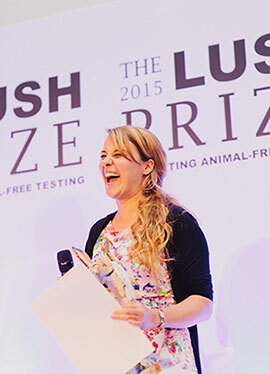 In 2015 the Lush Prize awarded a record £450,000 in prizes to 18 outstanding winners from 9 countries. The awards were presented at a gala ceremony in London – see photo galleries of the event. In addition to £200,000 being shared by the winners of the lobbying, training, public awareness, science and young researcher awards, this year the judges decided to present our first ever Black Box awards, totalling £250,000, to winners involved in mapping the first ever ‘human toxicity pathway’. This year saw a record number of nominations and 51 projects were shortlisted for the 2015 Prize: from young researchers in Brazil, Europe, USA and Malaysia to training of scientists in alternatives to animal testing in Belarus, Ukraine and South Korea. See the full 2015 shortlist. Bianca Marigliani, a Young Researcher winner in 2015, explains how the Lush Prize helped her to pursue the research she wanted. We had a day of discussion on this subject with presentations from winners of the 2015 Lush Prize and a range of leading speakers from around the world, on the subject of ‘Adverse Outcome Pathways – What, How and Where Next?’. All of the presentations from the day are available to download. You can stay in touch with news about the Prize by signing up for occasional email updates. We had 18 outstanding winners of the 2015 Lush Prize from 9 countries in 6 prize categories..
An international conference on the theme: ‘Adverse Outcome Pathways – What, How and Where Next?’.